Sold in September 2016, the 35.5 metre motor yacht JBH is back on the market, renamed Tommy Belle and listed for sale by Kevin Bonnie at IYC. With naval architecture by Trave Schiff-Technik, Tommy Belle was built by German yard Lubeck Yachts in steel and aluminium and delivered in 2011. 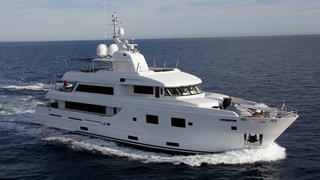 She has an interior styled by Egg & Dart accommodating up to eight guests in four cabins. These consist of a master suite, VIP suite and a double and twin cabin, all with entertainment centres, Loewe HD television screens and marble en-suite bathroom facilities. In addition, there are quarters for seven crew aboard this yacht for sale. The open-plan saloon has décor by Fendi, L-shaped seating, a bar and an entertainment centre including a Loewe HD television screen and full multi-media access. Up in the skylounge is a bar, ice maker, games table with four chairs and a further entertainment centre including a Loewe HD television screen. The aft deck is vast, with U-shaped seating and a large table along with built-in upholstered bench seating and sunpads. Tommy Belle has plenty of deck space for lovers of the outdoors, including a huge sundeck with two barbecue grills, a bar, ice maker and a Jacuzzi, plus access to the dumb waiter from the galley, perfect for al fresco entertaining and dining. Twin 1,100hp MAN diesel engines give her a top speed of 14 knots a range of 3,500 nautical miles at 12 knots. Tommy Belle is asking €7,900,000.